Bamboo shoots or bamboo sprouts are the edible shoots of bamboo species Bambusa vulgaris and Phyllostachys edulis. It usually the new bamboo culms that come out of the ground which is very young and crunchy. They are used in numerous Asian dishes and broths, and are available in supermarkets in various sliced forms, both fresh and canned versions. In Philippine cuisine, we call this "Labong" or "dabong". Two most popular dish for this is the "Ginataang Labong" (labong with coconut milk and chilies) and "Dinengdeng na Labong" (labong in fish bagoong with string beans, saluyot, and tinapa). Our place is abundant with this kind of food which we can get from bamboo for free. 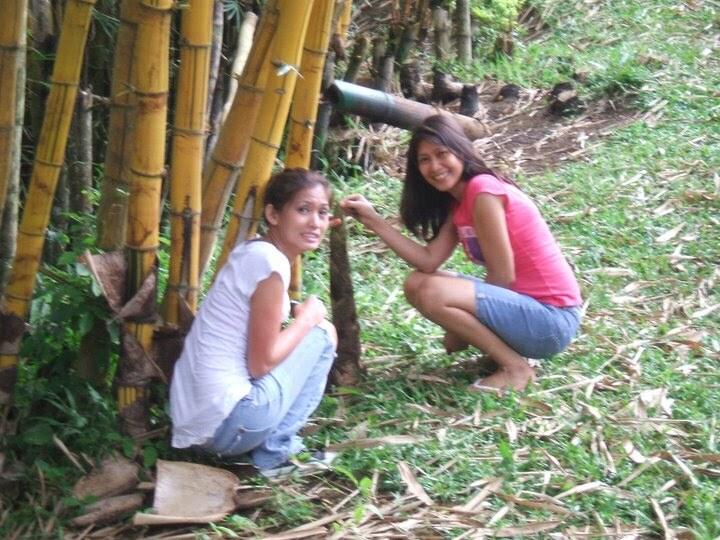 This is the picture of my sisters visiting our hometown and reminisce our old lifestyle. agoy gimingaw ko sa dabong da...lami kau sagulan dayon ug karne...or d ba kaha tinae...ehehehe!